Pompey will be very difficult to oust from the top of League One if they improve their home form. That is the verdict of Fratton Park hall-of-famer Steve Claridge, who has backed his former club for promotion this season. Kenny Jackett’s side are on track to be playing in the Championship next campaign after a brilliant start to this term. They sit at the summit of the table on 38 points – two clear of second-placed Sunderland. A significant reason behind Pompey’s league position has been their away form. They’ve yet to suffer a defeat on the road, registering eight wins and two draws. Claridge sees no reason why the Blues can't continue their scintillating run of results. 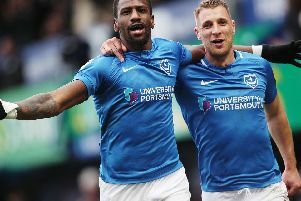 And the ex-Fratton Park manager believes if Pompey improve at PO4 then their rivals will find it tough to dislodge them from the top of the table. Speaking at Friday’s Checkatrade Trophy second-round draw at their Lakeside North Habour base, Claridge said: ‘Certainly, away from home they have been fantastic. ‘If they can improve that home record then they’re going to be very difficult to finish above. ‘Of course promotion is realistic, although people wouldn’t want to bring pressure on the situation. ‘They’re top of the league, played really well and there’s no reason why they can’t keep that going. ‘Getting the away form is normally the difficult bit for football clubs, but they seem to have got that pretty much under wraps. ‘If they can just be a little bit more expansive at home then there’s no reason why they can’t get promotion. ‘This season will be dictated by when they have their little hiccup. They haven’t really had that flat line yet. Pompey have made a significant improvement during Jackett’s second season in charge. Last term was essentially a free hit for the boss, as the Blues acclimatised to their new League One surroundings. Claridge reckons it allowed Jackett the chance to identify the areas that needed improving to forge a promotion charge. He was impressed with this summer's recruitment, with the likes of Ronan Curtis, Tom Naylor and Craig MacGillivray brought to Fratton Park. And, along with the backing of owners Tornante, Claridge feels the club has 'all the ingredients' to be successful. He added: ‘They’ve got everything in place – a realistic expectation, fantastic backing, a chairman who is going to do things the right way and a manager who has been successful at this level. ‘They’re all the ingredients you need. ‘Last season was a marker and, thankfully, Jackett is at a club where finishing eighth was fine, no problem. ‘Now all of a sudden it is starting to come together. ‘The recruitment has been good but you would imagine that. Jackett knows the level, has been around and knew exactly what he wanted. ‘He had that marker last season and was able to pick and choose what was good enough and what wasn’t.